Maintaining the highest of standards and setting the pace. About 20 miles south of Douglas, Wyo., along the Laramie Range, runs a creek that was notoriously tough to cross by settlers on the Oregon Trail. Often, the brace that connected a wagon’s tongue to its running gear—sometimes called the hound—would bust. Before long, the creek was named Wagon Hound. More than 100 years later, Catherine and Art Nicholas purchased 200,000 acres along the creek and surrounding mountains and dubbed it Wagonhound Land and Livestock. The quarter circle, bar, quarter circle brand—carried by all the cows and some 175 horses—is a loose interpretation of the hound of a wagon. “The brand dates back to the Wyoming Territorial days,” Ewing says. While the ranch has gone to great pains to restore and maintain its historical elements, it works just as hard to lead the ranching industry in its various interests. The horse program, in particular, boasts leading sire WR This Cats Smart, and many of the ranch’s young horses are champions in the Reined Cow Horse, American Quarter Horse, and Ranch Horse associations. 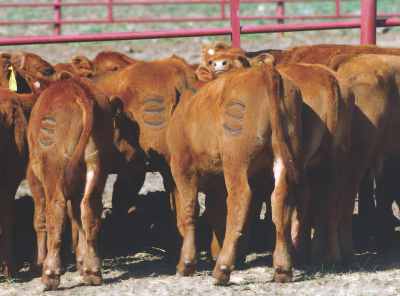 The cow division was named the 2015 Commercial Producer of the Year by the Red Angus Association, and the outfitting division has raked in honors from the Wyoming Outfitters & Guides Association.